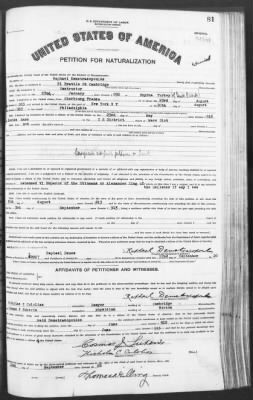 Petitions of the U.S. District Court, September, 1906 to June, 1929; military petitions for the US District Court, January to July, 1919; and petitions for the former US Circuit Court, October, 1906 to December, 1911. In many cases copies of the declaration of intention and copies of the certificate of arrival are included with the petitions. The petitions are arranged chronologically by the date the petition was filed in the court, and numbered consecutively.